Welcome to the Freeola Internet customer support pages. 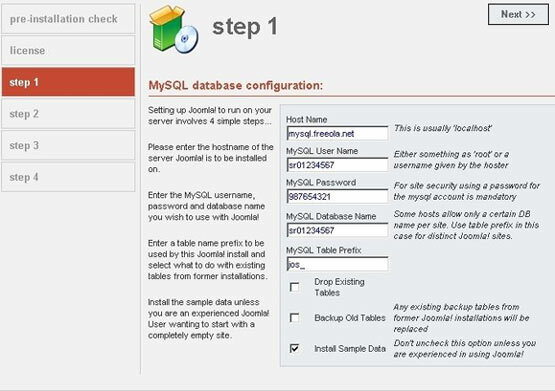 This guide is designed to give some general information about installing Joomla using a Freeola MySQL Database. For more internet help topics please visit our main Support Page. Provided here is a run-through of setting up a common content management system called Joomla. The first thing you will have to do to install this package is to download the file and decompress it. Most website scripts will be supplied in .tar.gz format, this is similar to a ZIP format and can be extracted using Winzip or Winrar. You will then need to upload the website using an FTP client, we usually recommend that customers use Filezilla as it is friendly and free to use. If you want the software you are installing to be your default website then you can upload the website into the root of your htdocs folder, but if you just want to evaluate the software then we would recommend uploading the website into a subfolder and running it from there. Once the files have been uploaded it will be time to start the next stage of the installation procedure which is done via your web browser. You will need to visit your website address (ie http://www.mydomain.com) and if you have installed the website in a subfolder add the subfolder on the end of the url (i.e. http://www.mydomain.com/joomla). You will see an image similar to the one below appear click the Next button. A license agreement will be shown which you will be deemed to have accepted when you click Next. A webpage similar to the one below will appear asking you to fill some details in. Host Name which will be mysql.freeola.net if you are using our standalone Optional MySQL, otherwise leave it as the default local host if you are using VIP MySQL. MySQL User Name will be the number in the form sr0XXXXXX to which your MySQL has been assigned. MySQL Password will be the corresponding password to the account. MySQL Database Name will be the same number that you used for the MySQL User Name. You can safely ignore the MySQL Table Prefix unless you are running multiple Joomla sites using the same MySQL username. Click on Next and you will be asked to give a name for the Website, this can be anything. Click Next again when you have finished and you will be asked to confirm URL admin e-mail and file directory chmods. You should not need to change anything other than to add in your E-mail address and either change or make a note of the Admin password. Click on Next again , you will be reminded of your username and password and asked to remove the installation directory, this can be done by connecting via FTP and deleting the folder installation from within the folder you have installed Joomla into. You can now log into your Administrator account using the link on the page to start managing your website. Host Name which will be localhost. MySQL User Name will be The name you have given to the relevant database. MySQL Password will be The password you have given to the relevant database. MySQL Database Name will be the same name that you used for the MySQL User Name.